Today the 2009 F1 cars from Renault and Williams were announced and immediately became the extremes of livery design. The Renault R29 is a garish combination of white, yellow, orange and red, whereas the Williams appeared in an interim color scheme of midnight blue. Reaction has been predictably horrified at Renault's awful solution to their problem of clashing sponsor colors and universal approval of Williams' quiet but dramatic single color. That first impression is not helped by the fact that the R29 is the ugliest of the new cars anyway. The nose is unusually blunt and broad and this is compounded by a curious construction immediately beneath it. Some aerodynamic tweak may have demanded this but it looks as streamilned as a brick. The Renault is also the first design to have retained the rear fin, perhaps as advertising space, and the car ends up looking like a mobile billboard. Last year I sympathized with the designer's task of somehow uniting so many colors into a reasonably tasteful whole and it was difficult to see how he could have done better; we became used to the R28 in time and its livery was eventually accepted by the fans. But the design this year is terrible, the yellow and orange clumsily handled in silly stripes, the white serving to emphasize the awkward nose and the red bits looking like replacements found in a junkyard. This time there can be no excuse. In 2008, it was understandably difficult to make white, yellow, orange and blue live happily together - there should be no difficulty in harmonizing such related colors as yellow, orange and red on a white background this year. The fact that the mirrors are unnecessarily red tells me that little thought has gone into integrating Total's required color; the designer has just thrown everything together in the vague hope that we'd get used to it. The fact that the Williams is the diametric opposite in livery design is entirely due to the fact that this no-nonsense team has waited to reveal its ultimate color scheme. The plain fact is that any car looks best in one shade only with advertising reduced to highlights in a contrasting color. There is no reason why the corporate colors of the sponsors should be allowed to take over the entire car; certain areas of the car are sold to the sponsors and they should be limited to those. Perhaps the Renault designer should consider how Ferrari manages the problem - Ferraris are always red and advertisers have to conform to that fact. 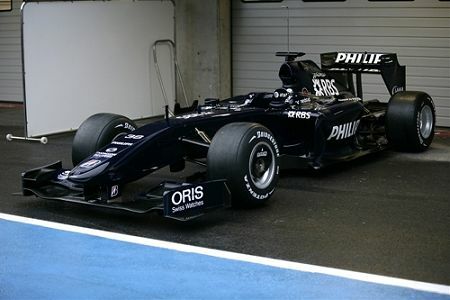 The Williams FW31 is a pretty car anyway, adhering closely to the rules and a clean and pure shape as a result. As with last year's offering, it is hard to see how the final livery can be any better than its present dark and unfussy appearance. If looks were the deciding factor, the FW31 would be up there at the front, competing for race wins. Unfortunately, the old adage that what looks right, is right, is no longer true. Last year the multi-colored Renault had the legs of the sober Williams and is likely to do so again this season. In the end, color and style do not matter and it was only coincidence that the awful earthdream Hondas were such bad performers on the track. Looks matter to us, the fans, of course, and it must be hard to continue one's support for a team that produces a truly ugly livery. And that is one reason why I hope the BMW guys retain their sanity and have nothing to do with the alternative livery suggested by Bruno Mantovani, as pointed at by F1 Fanatic in the article "Can you make 2009 F1 cars look good?". You might fancy having a bash at that one - go on, I dare you! Ah, can you imagine if they all do what Ferrari? We'd get orange McLarens, dark blue Williams' and yellow Renaults for starters. They'd look beautiful! Since I first saw the Renault earlier today I have struggled to make up my mind as to whether I hate the livery or the car more. The livery shows an incredible lack of thought. My first instinct when I see something that is so badly designed is to ask what the other options that were discarded looked like. I can only assume that they were so bad the original panel considering them was blinded and the final decision was made by touch. That nose is huge. Being aware that the car had failed a crash test I was absolutely shocked when I saw the nose. I had pictured something as small as is allowed by the rules not something that filled the maximum amount of space. I really wish Williams would tace that livery. It is far better looking than their race livery from last season. It is totally distinctive and unlike the more garish designs there is no difficulty in reading the sponsors names which I thought was the whole point. Imagine a TV director cutting to the Williams after the Renault. It would be very restful on the eyes. The Renault is the ugly duckling you where inquiring about. I doubt if any color scheme can cover up how odd that car looks. Haplo: And no more mistaking one car for another in the races! Steven: I had a red car once, a little Citroen AX14TZS. It was the reddest thing on the road, a gorgeous deep colour that made any other red car look orange. And that is what this Williams would do to the Renault were it to line up next to it on the grid - the FIA might have to ban the FW31 to prevent further embarrassment to Renault. Aracer: You're right, the ugly duckling has surfaced exactly on cue. I spoke too soon in my earlier post, obviously. Like calling it the Renault R29 "Truffle Hog".... How about Renault "Dingo", or R29 "Blunderbuss". If they think it will transform over time they could call it the R29 "Gosling." The design of the Renault is very interesting. The nose is square, almost reminiscent of the old Benetton, and the side pods are quite rounded. Almost as if they either know something we do not or they couldn't make up their collective minds. It's hard to get a feel for the Williams as the dark color hides the cars lines. So far, the Ferrari and the McLaren are the most appealing to look at. 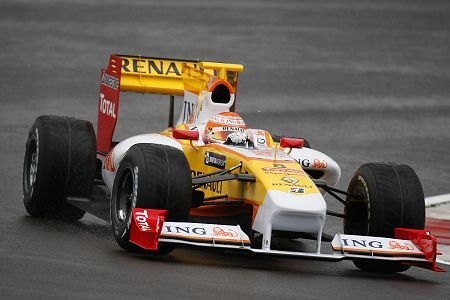 The overuse of yellow and orange on the Renault makes it look like something from the 70's or early 80's, for better or worse. The deep blue of Williams seems to suit the new wing designs best, perhaps because dark colors make the differences less visible?